With the recent publishing of the FREE EBOOK edition of the CFTC’s best-selling investment fraud paperback book Ponzimonium: How Scam Artists are Ripping Off America on the U.S. Government Bookstore website, Government Book Talk interviews the team behind Ponzimonium at the Commodity Futures Trading Commission (CFTC)– Commissioner Bart Chilton, Consumer Outreach Officer Michael Herndon, and Whistleblower Office (WBO) Director Christopher Ehrman– to talk about life after Ponzimonium was first published and the state of the CFTC’s battle against investment fraud. Background: What is Ponzimonium about? “Ponzimonium: How Scam Artists are Ripping Off America introduces some of the lesser known, but equally despicable fraudsters that have been uncovered since 2008 by the CFTC and SEC (Securities and Exchange Commission). In addition to the engrossing stories of crime and consequences, Ponzimonium also includes some very useful features for consumers that make this a valuable resource for any investor to avoid getting scammed, including Red Flags of Fraud, Investor Checklist, Fraud Resources and a Glossary of Terms, among others. To learn about how a Ponzi scheme works and more details of the book, read our Part I blog post. Government Book Talk: Commissioner Chilton, now that it’s been two years since Ponzimonium first came out, what has been the reaction to the publication? Commissioner Chilton: It’s been great! The media has helped to get the word out about how folks need to be cautious. A lot of times, in conjunction with a speech, the organizers will provide copies to their participants. I get all sorts of positive feedback from people and schools are using it as well. But, most importantly, I receive letters and emails all the time from folks who, because of this book, avoided making a major misstep. Some have questioned their investment choices and saved themselves and their families a lot of agony. GOVBOOKTALK: What are you most proud of with Ponzimonium? Chilton: I’m most proud that we created something totally different for the Government with this book. Ponzimonium is about real life Ponzi scams that is told in an engaging way and it’s actually helping people avoid becoming a victim of a financial fraud. It’s more than just another spiffy web site, or a brochure. Those things are great and necessary too, but Ponzimonium is a value-added education tool which never existed before. It’s a new and needed tool in our education and outreach arsenal. GOVBOOKTALK: Any examples of how consumers or others are using Ponzimonium? Chilton: In addition to consumers who have printed it off or purchased it in print and now are downloading it for free as an eBook from the GPO bookstore, we have many professors who are using Ponzimonium as a supplemental teaching text. The book has been used at Georgetown University, the University of Chicago, New York Law School, Rice University, Notre Dame, Northwestern, Washington University in St. Louis, the University of Delaware, Cornell and several other colleges and universities, not to mention many high schools. If you would like copies of Ponzimonium for educational purposes, please contact our outreach office at consumers@cftc.gov. Also, we just started offering Ponzimonium to public libraries and have had an excellent response. Some are even providing extra copies of it to patrons in addition to keeping one in their permanent collection. Our Office of Consumer Outreach is continuing to explore ways to get the book and its message out to the public. Current Status of Investment Fraud in the U.S.
GOVBOOKTALK: Michael, do you believe the amount of fraud is increasing and if so, why? Michael Herndon, Consumer Outreach Officer for the CFTC: Federal, state and local law enforcement officials have reported enormous increases in tips and criminal activity since the economy tanked in 2008, and are still witnessing historic levels of these scams today. At any one time, enforcement staff at the U.S. Commodity Futures Trading Commission (CFTC) are investigating anywhere between 750 and 1,000 individuals and entities for various violations of the law. Increases in tips and fraud cases have also occurred at the U.S. Securities and Exchange Commission (SEC), at the Federal Bureau of Investigation (FBI), in the states, and in various localities around the world. GovBookTalk: What are some common con artist tactics to watch out for? * “Easy Money”—dangling the prospect of quick riches and enticing you with the high returns you want but can’t find elsewhere. * “Credibility”—trying to build credibility by claiming to be with a reputable firm, have a special credential, or possess lots of experience. * “Social Consensus”—leading you to believe that other savvy investors have already invested. * “Tradeoff”—offering to do a small favor for you in return for a big favor, like take you to lunch and then ask you to invest with them. * “Scarcity”—creating a false sense of urgency by claiming limited supply or time limit of the investment. GovBookTalk: Any additional advice to consumers not included in the original book? Herndon: Report fraud! We know that falling for a fraud is painful and can be financially devastating. Yet so many people don’t report fraud that’s happened to them for a variety of reasons including shame and a sense there’s no point in trying to get their money back. However, there are several financial benefits of reporting fraud including tax implications and possible restitution. And I always like to remind people, for fraudsters, ripping people off is their job and sadly they are very good at it. There’s no shame in making a mistake to someone who is that good. GovBookTalk: If a consumer suspects something “fishy” with a proposed investment, how does he check it out? What is the process s/he should follow? Whom should they contact? Herndon: If a consumer suspects something fishy, there’s VERY good reason for that usually. You’d be surprised how many people think something is odd about a deal, yet go ahead with it. That gut feeling often proves to be correct. As for checking it out, there are a few simple things consumer should ALWAYS do, no matter the profession. First, check with an independent government agency or authority about the person or business. If you ask someone, “Are you legitimate?” of course they will tell you yes, and that their registered as they need to be. However, with a few quick phone calls or internet searches you can find out for yourself. For individuals under CFTC jurisdiction, consumers can find information on the National Futures Association’s Background Affiliation Status Information Center database (BASIC). For other investments, you can research brokers, brokerage firms, investment advisers and firms with this free tool from the Financial Industry Regulatory Authority, FINRA’s BrokerCheck. Also, just a simple call to see if the person has a business license or even searching their name on an internet search engine can help. My advice is always consult THREE independent sources for background information before you invest, or conduct any financial transaction for that matter. GovBookTalk: Thanks, Michael, this is great advice for our readers and their friends and families! GovBookTalk: Christopher, what about a whistleblower in a company that suspects something illicit is going on? How should s/he report his/her suspicions and why? 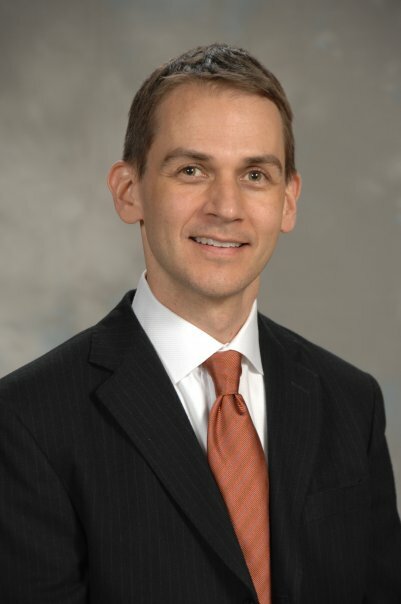 Christopher Ehrman, Director, Whistleblower Office (WBO): The person is encouraged to report the information to the CFTC’s Whistleblower Office. The office was created to receive and process original information from individuals who voluntarily report potential violations of the Commodity Exchange Act. The program provides monetary awards if the CFTC brings an action, based on that information, resulting in more than $1 million. If the person chooses to report internally first, their information will be deemed to be submitted to us on the date they reported it internally if they also report it to us within 120 days of that date. Under these circumstances, we will consider their place in line for determining whether the information is “original information” to be the date they reported it internally. Also, the fact that the whistleblower reported their information internally, and the extent to which they helped their company uncover a violation, will be considered as factors that may increase the size of any award that they are eligible to receive. However, please note that a whistleblower is not required to report internally to be eligible for a whistleblower award, and they may submit their information directly to us at any time. For a more detailed overview of the CFTC Investment Fraud Whistleblower program and how to contact the office, please visit http://www.cftc.gov/ConsumerProtection/WhistleblowerProgram/index.htm. Government Book Talk: Thank you, Christopher. Hopefully, those who have knowledge of a known or suspected fraud going on will get in touch with your office and prevent these despicable criminals from devastating more lives. Which brings me to my last question. Michael, speaking of “these despicable criminals”, inquiring minds wish to know if there are any updates on the perpetrators listed in the original Ponzimonium book? GovBookTalk: We– and America– can’t wait! Thanks again to all of you at the Commodity Futures Trading Commission and for all you do to help honest investors. How can you get a copy of Ponzimonium? With this special offer, the GPO best-selling book on Ponzi schemes and other investment frauds and how to avoid them, Ponzimonium: How Scam Artists Are Ripping Off America, is now AVAILABLE FOR FREE as an eBook from the CFTC on the US Government Bookstore website. Download Ponzimonium in PDF format. Download Ponzimonium in eEPUB eBook format with reflowable / resizable text. One of the points I’ve been trying to make via this blog is that Government publications can be well written, well designed, and otherwise comparable to books published by mainstream trade and academic publishers. For this Library Journal Notable Federal Government Document, though, I’m not going to make that point. Investigation of Failure of the Securities and Exchange Commission To Uncover Bernard Madoff’s Ponzi Scheme is the classic stereotyped Government document. It has an indigestible title, a 19-page table of contents, weighs a ton (or at least 3 pounds, 4 ounces) and is written in deadpan Governmental investigatory prose. In addition, the subject matter is pretty depressing. Stings and Ponzi schemes may be amusing in movies and books, but not if you’re the one who gets taken to the cleaners. To make matters worse, this report demonstrates that the Securities and Exchange Commission (SEC) repeatedly failed to detect wrongdoing on the part of the perpetrator. So why did Library Journal cite this report as a Notable Document, and why am I blogging about it? According to LJ, “This report examines the agency’s failure to investigate complaints it received over many years regarding Madoff’s activities. Along with supplementary material on the SEC web site, it clearly and fully addresses the commission’s shortcomings.” According to me, as an assiduous reader of international news, there are few places in the world where a government would investigate itself intensively and publish irrefutable information on its shortcomings to its own citizens. This report was covered thoroughly by the media when it was first issued. Although few would read it from cover to cover (me included), the facts are now out there for all to see and ponder. 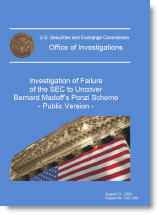 Investigation of Failure of the Securities and Exchange Commission To Uncover Bernard Madoff’s Ponzi Scheme is available online, for purchase, and in libraries. You are currently browsing the archives for the Securities and Exchange Commission category.